Suicide Rivals The Battlefield In Toll On U.S. Military Alarmed at the growing rate of soldiers taking their own lives, the Army has begun investigating its mental health and suicide prevention programs. It is part of a greater awareness of the problem by all branches of the military. But the tougher challenge is changing a culture that is very much about "manning up" when things get difficult. 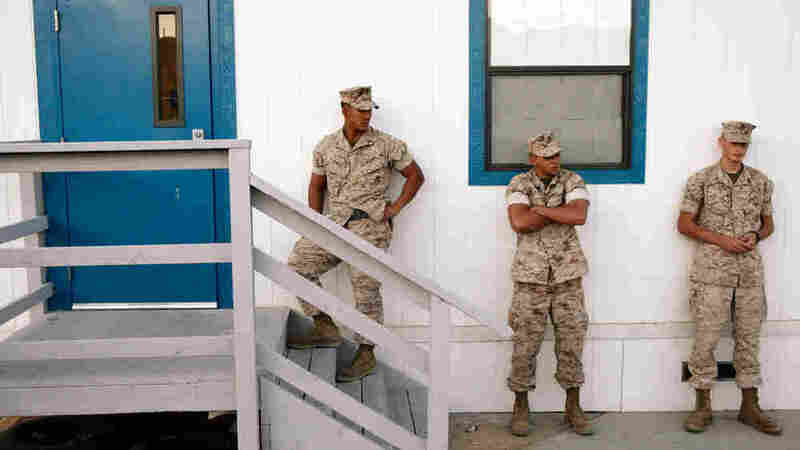 Marines wait outside a building to take psychological tests in September 2009. 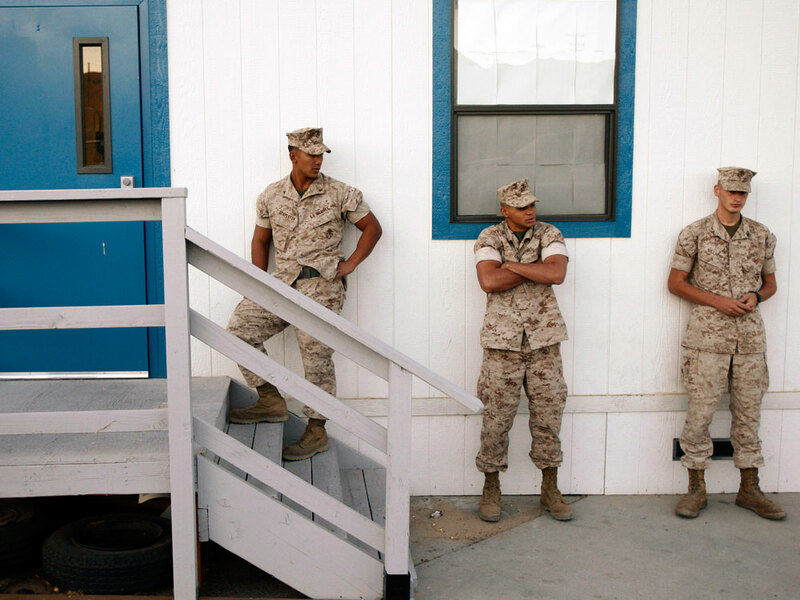 The military assesses troops in search of clues that might help predict mental health issues. Stephen was participating in an Army-run mental health assessment program. His father's main complaint against the Army is what it missed in screening his son. "The day after he told the folks in that reassessment that he was planning on committing suicide, he did," Ed Colley says, pausing. "Yeah, wow." It was Stephen's second mental health assessment. The first, right after he came back from Iraq, seemed pretty normal. He was on a superhighway toward suicide and there were many off ramps, many opportunities for something different to have happened. But during his time in Taji, in central Iraq, the helicopter mechanic spent 24 hours under suicide watch. That information never made it to his new commander in Fort Hood, Texas. To Edward Colley, that was just one in a long list of missteps by the Army. "He was on a superhighway toward suicide and there were many off ramps, many opportunities for something different to have happened," he says. In his second mental health assessment, Stephen answered yes on a form when asked if he had thoughts of suicide. He said he was thinking of harming himself "more than half the time." Instead of acting on Stephen Colley's answers, the social worker dealing with his assessment enrolled him in a sleep study to begin three weeks later. 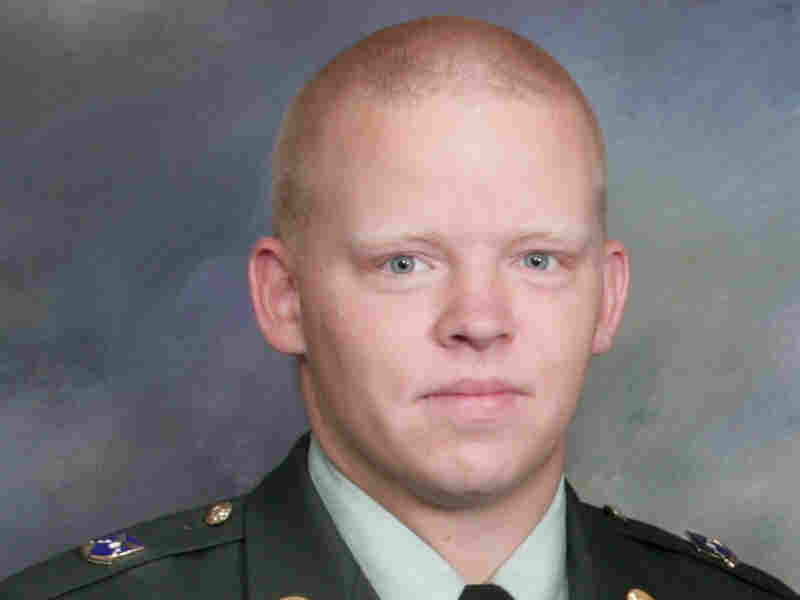 The Army's investigation into Stephen's death said the established procedures failed to address his mental condition. "If Pfc.Colley was admitted to the emergency room following the mental screening, it is unlikely the suicide would have occurred," the investigation concluded. There were 197 Army suicides in 2008, according to the Army's numbers. The total includes active- and non-active-duty soldiers. Last year, the number was 245. This year, through May, it's already 163. The Army has instituted many programs to counsel and train soldiers. Stephen Colley had undergone suicide prevention training. The suicides continue even as America's war in Iraq is winding down and multiple deployments are past. What is causing these men, and some women, to kill themselves? Every Army suicide investigation ends up in a conference room in the Pentagon. Army commanders, including medical officers, meet at the suicide senior review group once a month to go over each case. Gen. Peter Chiarelli, the Army's vice chief of staff, leads the two-hour meeting. The rates per 100,000 people of suicide among active-duty personnel in the Army, Marines, Navy and Air Force. The statistics show an increase in suicide rates since 2001, compared with the relatively steady rate of suicide among the U.S. civilian population. "We have 45 active-duty suicides, we have 13 confirmed and 32 pending. That number is down." He adds: "Thirty-six are not active-duty. There is no statistical difference between this year and last year in both those categories." Officers from Army bases around the U.S., as well as one in Iraq, join the meeting via videoconferencing. One after another, division commanders appear on the screen and go through the results of investigations into suicides on their watch. Hindsight reveals much. One soldier was on at least 12 different kinds of medication; another was in relationship counseling and had severe alcoholism issues. Some were being disciplined; one was facing court-martial. The details present portraits of troubled men, but in most of the cases commanders didn't know someone's background, his medical history, his disciplinary issues or his problems with alcohol. One soldier was diagnosed with both depression and bipolar disorder, was medicated, and then sent to Iraq. By the end of the briefing, Chiarelli is visibly angry. He directs one of the medical officers present to peel back the layers on this case. Later, he says the suicide rate is part of a much broader problem. One of the most obvious causes is the repeated deployments in Iraq and Afghanistan. "I think you have to have your head buried in the sand to not think a lot of them come out of 8 1/2 years of war," Chiarelli says. But some of them have nothing to do with the wars in Iraq and Afghanistan. For every PTSD-suffering soldier who takes his own life, there's a young specialist who has never been out of the country and is transitioning to a new unit and can't handle it. There are some who aren't young or newly enlisted. One case was a 43-year-old soldier who was twice divorced and had served 18 years in the Army. His file was marked "do not promote." He was never referred for a mental health evaluation, but he shot himself in the head. Because of the variety of cases and circumstances, Col. Chris Philbrick, director of the Army's suicide prevention task force, is reluctant to talk about trends or patterns, or anything that might be to blame for the numbers. The Army didn't do a good job. I'm certain that there are soldiers that we did not properly treat in the long period of time since we started combat operations, that if we had done a better job and been able to recognize that, [they] wouldn't be where they're at today, at Walter Reed, and [would instead be] on a street corner somewhere because they haven't been taken care of. Chiarelli put Philbrick in charge of the task force last year as part of the Army's strategy to combat the suicide rate. An easy answer is elusive, he says. "It doesn't exist. Because when we do look at the statistics, and literally do an autopsy in a very broad sense on every case that happens, the trends that we see are white male. But most of the Army is made up of white males. We see young soldiers -- most of the Army's made up of young soldiers." It's never simple, he says. However, some things do stand out. Soldiers in transition, moving from a combat zone back home, for example, are in danger. So are those with alcohol abuse problems. Many cases appear to involve both alcohol and overdose of medication. And for the most part, the cases speak to the Army's inability to deal with mental health issues. "Absolutely," says Philbrick. "Guilty as charged. And some of that is right there," he says, slamming his hand on the table over some files. "The Army didn't do a good job. I'm certain that there are soldiers that we did not properly treat in the long period of time since we started combat operations, that if we had done a better job and been able to recognize that," he said, "[they] wouldn't be where they're at today, at Walter Reed, and [would instead be] on a street corner somewhere because they haven't been taken care of." The Army took too long to recognize that it had a crisis on its hands. Philbrick says it was dismissive. "What did we do? What does the Army normally do when there was soldiers with problems we didn't understand?" Philbrick asks. "[We tell them:] 'Thank you for your service; go find someplace else to work.' We're making those changes." The changes include a five-year, $60 million study with the National Institute of Mental Health. There are online resiliency programs designed to test emotional, mental and social fitness. The Army says its screening methods now are as strict as they could ever be. But former military psychiatrist Stephen Xenakis, a retired brigadier general, says more needs to be done. "There's a whole culture change that would really need to occur at the bases here in the United States before we really felt that effect," Xenakis says. "It may not really be for two to three years until we really recognize that." Xenakis says change needs to happen at the local level, not just at the Pentagon. He also recommends that the military track things like DUIs, discipline problems, marital issues -- all things that could be potential red flags. They are the sorts of factors that might have alerted commanders to Stephen Colley's situation. Edward Colley complains about the way the Army handled his son. He wants it to learn and do better with someone else's kid. "It's a great system," Edward Colley says. "Properly done, it no doubt saves lives."